Quail Ridge staff & members had a fun time on Halloween with our first ever “Reverse Trick or Treat”! GM Bill Langley came up with this unique (and fun) way to show members how much they are appreciated. 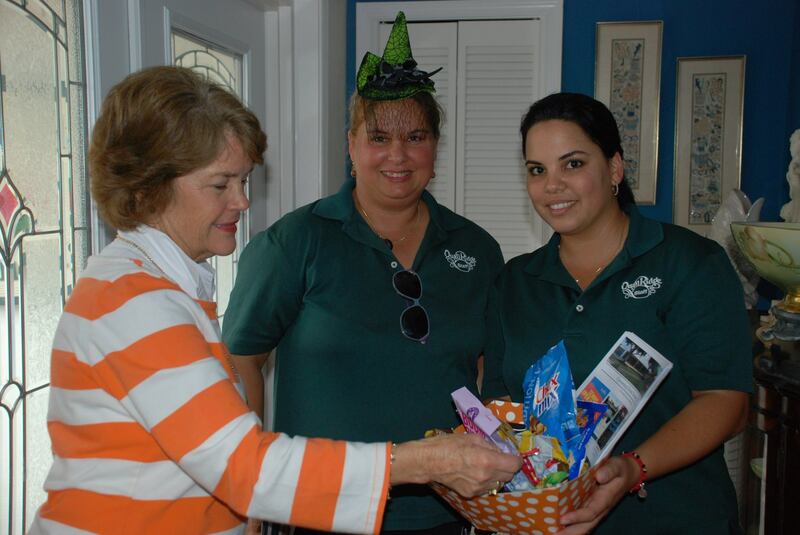 A fleet of golf carts carrying friendly staff members from all departments, outfitted generously with all sorts of treats and information about upcoming Club events and our new concierge program, visited every home in the community. Residents were surprised and thrilled with their treats! About 40 staff members visited all 946 homes in Quail Ridge. “Welcome Home” was the greeting of the day as many of our residents are just returning from their northern homes. A fun and memorable time for all! What a treat to find Adam and Watson at our home with their trick or treat basket!! The idea was treat enough. Thank you for such a nice gesture. We LOVE our staff, too!! Thank you Mr. & Mrs. Pugh! It was a great day!